Whenever you install a virus program, place 1 virus counter on that program. It is a Console, and for what it does it does it well. Any virus based deck is going to run it - If there are more than 3 or 4 different viruses in your deck it will see a good return for its money in the additional Imp or Medium counters, or any other virus. Any virus strategy will benefit from its inclusion. 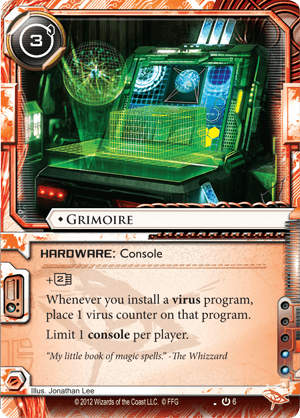 The +2 Memory is also a nice addition, especially when considered that viruses run best when you have more in play, plus a need for Icebreakers. It is not as strong as some consoles, and it is stronger than many others. It is for one archetype however, and that is the only one it is consistently good for.